Enjoy a memorable Shabbat experience! Join Riki Mulu and Chassida Shmella, a vibrant community founded by a new generation of Ethiopian-Israeli Jews in America, to celebrate the Sabbath with unique Ethiopian customs. Special guest will be Dr. Ephraim Isaac, director of the Institute of Semitic Studies in Princeton, NJ. Families are welcome. Space is limited; pre-registration required. Co-sponsored with Chassida Shmella and with Bechol Lashon. Dr. Ephraim Isaac, Ethiopian Yemenite Jewish scholar extraordinaire, linguist, conductor, historian and history maker, Director of the Institute of Semitic Studies in Princeton, NJ. Cook onions in oil for ten minutes until soft. Add tomato paste and chili powder and spices and cook another ten minutes or more until flavors blend. Add chicken and about one cup water. 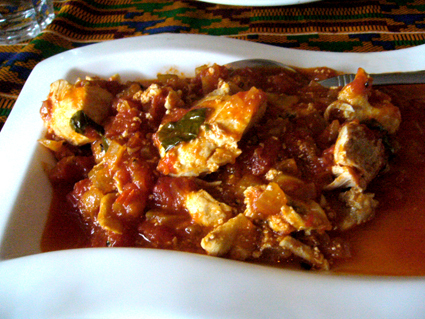 Simmer for about 45 minutes until chicken is thoroughly cooked. Add hard boiled eggs. Grind fresh garlic and ginger together. Grind one Tbsp flax seed oil. Add to chicken. Cook for about 2 more minutes. Raising a biracial Jewish daughter, a mother finds herself answering many questions: from her child, from total strangers, and from her own heart. That’s how Mae, my eight-year-old daughter, explains it, and she’s right. Sort of. Mae was seven months old when her father walked out and I became a single mom. At that point in my life, I’d never been so far from Judaism. I was firmly planted in motherhood, but it would take me a while to see that I needed my religious roots to unfold. Today, Mae is a spirited second grader with a beautiful afro, cinnamon skin, and full lips. Many people assume we’re not related. But Mae — who is quite a sensitive child otherwise—isn’t self-conscious about looking different from her Jewish peers. I, her mother, am the one who sometimes feels — or is made to feel — insecure. It’s not as if we shouldn’t be used to the idea of mixed-race heritage. There are Jews everywhere — Ethiopia, Russia, China, India. Everyone who visits Israel tells a story of meeting someone who, because of skin color or another physical characteristic, she simply couldn’t believe is one of us. In the United States, according to one study, one of every five Jews (1.2 million people!) is either black, Asian, Latino, of mixed race, or of Sephardic background. Not me. I’m white, of mostly Polish descent. My father is Jewish; my mother was born Catholic. She stopped going to church in her 20s and supported the raising of her children as Jewish (although she didn’t convert). I had a bat mitzvah and a confirmation. I went to Jewish summer camps. I went to Israel. I was told that 60 of my relatives were lost in the Holocaust — the single fact that always kept me deeply connected to Judaism. But when, in my 17th year, a rabbi in Israel told me that I wasn’t “really” Jewish because my heritage hadn’t been passed down matrilineally, I was crushed. In anger and disappointment, I distanced myself from anything Jewish for more than a decade. Twelve years later I had Mae. 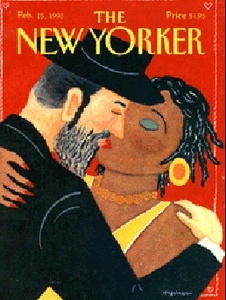 I was living in New York City, and, despite its large Jewish population, I didn’t know any who were of mixed race. When I moved back to the Bay Area to be near my family, there was a Jewish preschool down the street, but I was adamant about not sending Mae there: If I’d felt shunned for not having a Jewish mother, imagine how she would feel. So, I found a diverse, high-energy preschool; she cried for a week. Every afternoon when I picked her up, her eyes were bloodshot. Friends raved about the nearby Jewish pre-school, so I called: A spot had just opened up. I was unsure, but the moment Mae walked into Kitah Aleph, she felt at home. And she was not alone. Three children were Jewish Asian, one boy was African-American, and a Spanish-speaking girl — her mother, from Venezuela, had worked at the JCC for more than a decade — is still one of Mae’s best friends. Mae never wanted to go home when school let out. She learned how to count in Hebrew and how to braid (practicing on challah). She expanded my repertoire of Jewish songs tenfold. Lisa Williamson Rosenberg, a New Jersey psychotherapist and writer, is both Jewish and biracial (her mother is white and Jewish; her father was black). Fortunately, she reports, “the definition of what a Jew looks like has broadened significantly since I was a kid.” She remembers being told, “How can you be Jewish? You’re black.” “As if the two were mutually exclusive,” adds the mother of two (her husband is white and Jewish). Diane Kaufmann Tobin, associate director of the Institute for Jewish and Community Research in San Francisco, agrees. Clearly I’m not the only white mother who hopes her child will feel pride in every facet of her identity. Right now, Mae considers herself Jewish, while others define her — on the basis of what they can see — as black. Looking ahead, I’m not ready for the changes sure to come in her teenage years and beyond, both with how Mae sees herself and how the world does. My daughter, too, seems to have no questions about her Jewishness. She is secure and happy at our local JCC. She attends a Jewish after-school program and will soon start her fourth summer at Jewish day camp. When she’s with her Jewish friends, she isn’t shy, the way she often is in public. She volunteers to act in skits; she shows new kids where the bathroom is; she teases her counselors . (She did confess to embarrassment, however, when she was recently proclaimed “Mensch of the Week” in front of the entire after-school group). I’m the one still feeling like an outsider. I’ve got that answer down pat because adults and children have asked me many times whether Mae was adopted (along with other common kid questions, like “Why is her hair curly and yours straight?” and “Where’s her daddy?”). For me, biracial Judaism is a touchy subject. When white Jews ask about my daughter’s identity, I appreciate their curiosity as long as their tone is respectful and warm and as long as their questions are directed to me. Still, if Jews are not acknowledging my daughter’s biracial identity, are they really ignoring her? “Don’t look at the container, but look at what’s inside.” That’s from Pirkei Avot — Ethics of Our Fathers, Chapter 4, Mishnah 27. I’m led to that tenet by Rabbi Judah Dardik of the Beth Jacob Congregation in Oakland. Although we couldn’t be more mismatched — I’m a 35-year-old single mom who never goes to temple and had a child with a man outside the tribe; he’s Orthodox, married, and the father of four — Dardik is my go-to rabbi because he’s thoughtful, respectful, and patient. I catch him on the phone on a Friday, an hour before sundown, and apologize for not calling earlier. I tell him that I’m trying to write about what it’s like to raise a biracial Jewish child, but every time I sit down at my computer, what comes out sounds overly defensive. I’ve done something right, because clearly Mae isn’t afraid to show her “inside.” Maybe it’s time for me to open up a little bit, too. Two Jews in Love. Can you handle it? Come to terms with your own inner truths. “…The great Baha’i prophet, the Baha’ullah (1817-1892), called racism the greatest challenge to global unity. Jews should be champions of this ideal. Long before the Baha’ullah walked this earth, Jews were the world’s greatest conduit of multiculturalism. While Christians and Muslims spent most of the Middle Ages constantly building fences and re-drawing borders, Jews were constantly traversing them, carrying the best that every culture could offer. Thirty years – officially – after the first Ethiopian Jews set foot on Israeli soil, the first Israeli film about the Ethiopian community of the Holy Land is being released in theaters on Thursday. Filmmaker Shmuel Beru, who made aliya from Ethiopia at the age of eight, hopes to show Israeli audiences the richness of his community with Zrubavel, his first full-length feature film. Even after three decades, all that most Israelis know about this population of more than 110,000 is what they read in newspaper reports: problems of integration, juvenile delinquency, domestic violence – or, more rarely, one successful Ethiopian immigrant who becomes a doctor, a pilot or a famous singer or actor. But what do we really know about the Ethiopian Jews of Israel – their values, their traditions, their language, their music, their food, their dreams, their problems and how they deal with them, their feelings? These are the questions that Beru, 33, who started as an actor, wanted to answer by getting behind the camera. In Tel-Aviv’s Kerem Hateimanim neighborhood, a two-minute walk from Rehov Zrubavel, where he lives, Beru agreed to talk to The Jerusalem Post about this original project. BERU PRESENTS a picture, sometimes happy, sometimes sad, of a group of residents in an entirely Ethiopian neighborhood. All the generations are represented, from the patriarch of the Zrubavel family – a colonel in Ethiopia, now a street sweeper in Israel – to his eight-year-old, Israeli-born grandson Yitzhak – alias “Spike Lee” – whose dream is to make movies. 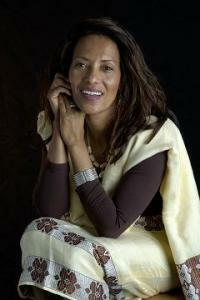 Through the eyes of the latter, Beru – who arrived from Ethiopia via Sudan one year before Operation Moses in 1984 – tells the story of Yitzhak’s aunt, Almaz, the “most beautiful girl in the neighborhood.” A talented singer, Almaz wants to marry a distant cousin, despite her father’s injunction to respect the traditional rule of not marrying a relative within seven generations. Meanwhile, Almaz’s brother Gili, pushed by his father, tries despite racism to enter a selective school to become an IAF pilot, as Yitzhak’s parents fight over whether their son will enter a yeshiva or become a soccer player. “My goal was to show that behind color and culture, there are human beings,” says Beru. “I wanted to create an opportunity to see us [Israeli Ethiopians] in a different way than people are used to, to go further than what the news released about us, to make people realize that we are not different from others. Although he had never directed before, Beru was undeterred. One of the issues Beru addresses in the movie is the gap between the older and younger generations in the community. “For the youth, it’s hard because they feel half-half – on the one hand, they want to be like Israelis, and on the other, they want to be like Ethiopians. And it is difficult for them to find a good balance, to mix. Especially when they have to face the reaction of their parents, themselves in a struggle to deal with a new culture and lifestyle very different from their old one,” he says. Beru also shows “a typical Israeli family” trying to contribute to their country. “The father is very Zionist. [He] wants his son, Gili, to defend his country, even though he already lost another son in the army. He wants him to be a pilot and to be recognized as a part of society,” he says. Beru admits that the character of Yitzhak, the young filmmaker, could be a reflection of himself, although he hadn’t planned it that way. Beru’s next film project is a personal account of his own experiences coming to Israel. Igaal Sizomu was clearly ecstatic, laughing with a group of friends from Shomrei Torah Synagogue (STS) whom he hadn’t seen in nearly a year. They were pushing each other around at the West Hills synagogue the way teens often do. Igaal, who is from Uganda, had spent five years adjusting to life in Southern California while his father, Rabbi Gershom Sizomu, was interning at Shomrei Torah Synagogue and attending American Jewish University’s Ziegler School of Rabbinic Studies. Last year, after Sizomu was ordained as a Conservative rabbi, the family returned to the Jewish community in Uganda known as the Abayudaya or Sons of Judah. But on May 12, Igaal returned to Los Angeles with his father and two other Abayudaya teens to learn leadership skills. The ultimate goal, as imagined by David Weingarten, president of Shomrei Torah Synagogue’s United Synagogue Youth (USY), is that the Ugandan teens will take what they learned in Los Angeles and establish a Jewish youth group in their hometown of Mbale. After Igaal, 15; Sarah Nabagala, 17; and Kokasi Keki, 17, arrived in the Southland, they attended leadership training sessions, planned sports events and coordinated a USY meeting. On the following Friday, the teens sang Abayudaya tunes and played African drums for Shabbat services with local USY members and more than 200 Shomrei Torah congregants. An additional 250 people attended a USY-Abayudaya Partnership event on May 19, where the teens and Sizomu gave an update of what life was like in the Abayudaya community. Igaal, the tall and lanky rabbi’s son, told the crowd he hoped to raise money through CD sales of Ugandan Jewish music to send local USY members to Uganda for a cross-cultural concert. The crowd erupted in laughter when he said that the biggest change since returning to Uganda was the lack of sweets. “In Uganda we don’t have desserts…. I love desserts,” he said. Sarah, another of the Abayudaya teens, said an important leadership lesson she learned during her trip to Los Angeles was to take the initiative. Weingarten, STS-USY president, said that he was impressed overall with the teens’ leadership skills and how proud they were of their Jewish identity. The idea for the teen training began at Sizomu’s farewell ceremony in June 2008, when Weingarten asked the rabbi what the West Hills community could do to help the Abayudaya. Sizomu told Weingarten how much of an impression the Conservative youth group had made on him, so they decided together to bring teen delegates from Uganda to Los Angeles to experience the USY members’ ruach (spirit) and leadership skills for themselves. The project, known as the USY-Abayudaya Partnership, started with a $2,500 donation from a local family to the Abayudaya community to make hand-stitched challah covers to sell at Shomrei Torah and regional USY events. The challah covers sold well, but Weingarten found the proceeds fell short of the $12,500 needed to finance the trip. “We realized we were going to need a lot more help than we initially thought,” he said. After Weingarten and his fellow USY members asked the Shomrei Torah community for donations a second time, more than 20 families, individuals and temple groups donated enough to cover the remaining costs. During the events, volunteers sold kippahs, necklaces and challah covers that had been handmade by the girls and women of the Abayudaya community to help raise additional funds for the Ugandan congregation. The Abayudaya Marketplace also included bags of Delicious Peace Coffee made by a coalition of Jewish, Christian and Muslim farmers from Uganda that was founded by J.J. Keki, Sizomu’s brother, the father of Kokasi, one of the visiting teens. Ever since Sizomu returned to Uganda as an ordained rabbi, Sarah said, their Muslim and Christian neighbors understand how committed they are to Judaism. Thirteen girls from the Jewish Agency’s Mevasseret Zion absorption center, all recent immigrants from Ethiopia, celebrated their Bat Mitzvah yesterday (June 1, 2009) in Jerusaelm. They received gifts, including a book of Pslams from President Shimon Peres. “From Tesfa to Tikvah: From Hope to Hope,” an exhibition of 20 photographs by Irene Fertik about Israel’s Ethiopian community, is at the Gershman Y’s Open Lens Gallery (www. gershmany.org) through to August 7th. Born in Philadelphia, Fertik is the daughter of the late Fannie Fertik, who wrote about kosher cooking in the pages of this newspaper for many years. The photographer, who now resides in California, travels to Israel every year, primarily to follow their Ethiopian community. Tesfa means “hope” in Amharic; Tikvah is “hope” in Hebrew. The transition from the language of their former homeland to that of their new home is just one small indication of the many changes and adaptations this community has faced since moving to Israel almost 20 years ago. The move from isolated agrarian mountain villages in Ethiopia to a modern technological culture in the Jewish state has meant incredible sacrifices for the older immigrants and enormous challenges for their children. For a photographer such as Fertik, this transition offers a veritable cornucopia of images. Fertik’s photographs show both aspects of the Ethiopian reality in Israel. An intimate family moment — an obvious reminder of the old ways and traditional clothing — is juxtaposed against a group of 21st-century kids in T-shirts and jeans leaning against a modern bus. Israel’s Ethiopian community now numbers 85,000. From this pool of possible subjects, Fertik has managed to create an intimate portfolio that has caught the attention of galleries and museums from Israel to Europe, as well as throughout the United States. Congregants and choir members heap on the praise during a recent Sefer Torah dedication ceremony at Congregation Temple Beth’El. Clearly, this was not your bubbe and zayda’s idea of shul. The day was a celebration in every sense of the word, with a four-hour service that included singing, a live band, shaking tambourines, dancing in the aisles and a revival-style atmosphere not often found in synagogues. “This is how we daven!” exclaimed Bowen. 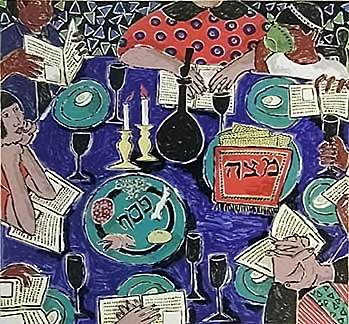 The predominantly African-American synagogue occupies an unusual place in the Jewish communal landscape: a vibrant, lively Jewish congregation comprised of a population not traditionally thought of as Jewish. Congregants of all ages came in droves for the big event at the largely African-American “Conservadox” shul in West Oak Lane. The congregation was founded by Bowen’s mother, the late Rabbi Louise Elizabeth Dailey, the daughter of a Baptist minister. Upon relocating to Philadelphia from Annapolis, Md., Dailey took a job in a Jewish household, where she observed many familiar practices she had seen growing up, things she had seen her father do, like keeping one’s head covered at all times, sitting shivah and salting meat prior to cooking. 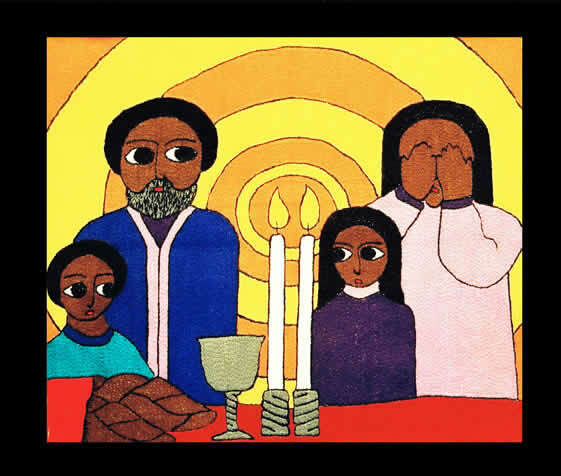 After prayer and reflection, she began to observe Shabbat and keep kosher, and ultimately converted to Judaism. The congregation grew out of a prayer group she held in her home. She added that the community avoids identifying by terms like Hebrews, Israelites or Black Jews because of people’s preconceived notions regarding such language. She pointed out that Hebrew Israelites have at times been listed on the FBI’s list of subversive groups and have been known for spewing anti-Semitic rhetoric — neither of which she wants to be associated with. While she pointed out that many African-American Jews are unaffiliated and worship informally, she also noted that the 2005 book In Every Tongue: The Racial & Ethnic Diversity of the Jewish People by Diane Tobin, Gary Tobin and Scott Rubin, estimates about half-a-million African-American Jews, a number she believes to be very low. Gary Tobin is director of the Institute for Jewish and Community Learning, of which Bowen is a member. He also helped her meet other multicultural rabbis around the country. Yet Temple Beth’El has always kept a low profile — something that Bowen said was intentional. As such, she said, the synagogue started its own kosher butcher shop, its own kosher catering business, held its own services and early on, even wrote its own siddur, although they now rely upon Siddur Hadash, a Conservative prayer book co-edited by the late Rabbi Sidney Greenberg of Temple Sinai in Dresher. Bowen said that the siddur has been in use there for more than a decade. They also rely on the Hertz Chumash, or Torah commentary (although Bowen said that the board is currently looking into acquiring a different Chumash). Sunday’s dedication service included four aliyot honoring members of the synagogue and those involved with acquiring the Torah. Additionally, seven rabbis from Chicago, Atlanta, New York and elsewhere participated in the service (not all of them African-American), leading seven hakafot, or Torah processions, and reading different psalms. The day was capped off by a kiddush luncheon catered by Kosher Hands Catering, the shul’s own catering service. Every Saturday, the congregation holds what Bowen called lively but traditional services that draw a crowd she classified as younger than what one might find at many other synagogues. As for minyans, because many members now live in the suburbs, Bowen said that they pray at 6 a.m. daily in their homes, knowing others are doing it as well. On certain occasions, like Rosh Chodesh, a traditional service takes place at the shul. For Bowen and her congregants, living quietly means worshiping and keeping their doors open, though not really proselytizing or seeking to attract people. That sort of thing, in too many cases, she said, often leads to questions about authenticity. Bowen is not a member of Vaad: The Board of Rabbis of Greater Philadelphia, which requires that members be graduates of recognized seminaries as well as be a member of a national rabbinic group. While Temple Beth’El has had little formal involvement with community, Bowen said her congregation has connected with other Jewish institutions. She has spoken at places such as Congregation Beth Or in Maple Glen, and holding joint services with Congregation Tiferes B’nai Israel in Warrington and Congregation Or Ami in Lafayette Hill. Bowen also pointed out that the Torah dedication service drew a number of African-Americans who aren’t Jewish — people, she said, who might not have shown up in the past. Moments like that mark “a beginning of understanding,” she said, adding that the African-American and Jewish communities could continue to find similarities based on mutual respect. Bowen said that many members of her congregation supported President Barack Obama last fall, and that they regularly pray for the president’s success. While Bowen leads the congregation in these prayers, she did not support the president in his 2008 campaign; the 63-year-old rabbi is a registered Republican. For Bowen and her congregants, the majority of last Sunday was spent celebrating the idea of Judaism as a big tent. “When you look at the broader scope of things, we’re all cut from the same cloth,” chimed in 26-year-old David Best Jr.
Congregant Israel LaPrince, 31, noted that, while the temple might have a different style from some other synagogues, the traditions are the same. This article originally appeared in the March 2009 issue of Interfaithfamily.com, Encouraging Jewish Choices & a Welcoming Jewish Community. Reprinted by permission. My father is Japanese. My mother’s father was Russian Jewish, her mother Irish. My wife is an Ashkenazi Jew of Polish and Hungarian descent. My son has Japanese, Irish, Russian, Polish and Hungarian blood coursing through his veins. He’s Jewish no matter whose version of Jewish law you follow. My wife is Jewish, so he’s Jewish. But I was not born Jewish. Am I Jewish? Answer: yes, I converted with a Conservative rabbi. But Orthodox Jews don’t accept Conservative conversions. Answer: I converted Orthodox. But Israel doesn’t acknowledge Orthodox conversions from the United States. Answer … I cannot continue to define my Jewishness for judgmental Judaism. Two conversion ceremonies will have to do it. Who is the arbiter of measuring the single experience of a “Jew” in feeling Jewish, of a Jew’s relationship with God? Judgmental Judaism reinforces the comfort of belonging by using language. Language forms the experiences we choose to inhabit. And judgmental Judaism continues to fragment -Reconstructionist, Reform, Conservative, Conservadox, Modern Orthodoxy, Orthodoxy, “Ultra,” Chassidism, Haredi, Post-Denominational, Interfaith, LGBT, Un-affiliated, Secular. I don’t mind that Jewish people inhabit religious and spiritual spaces of their choosing with like-minded Jews or non-Jews, but I do have an issue with the root cause of all this fragmentation–that Jews are denying the existence of a diverse Judaism. I can already hear the accusatory pleas of all the fragments of Judaism. “They” are too religious and out-of-touch with the modern world. Unless “they” are observant Jews who observe kashrut, halacha and the 613 mitzvot, “they” are not real Jews. This is about acknowledging the subjective in order to get to the objective. There are religious hypocrites and those that are ideologically spiritual (which really isn’t spiritual). Woody Allen once said, “I’m a bigot, but for the left.” That’s how I feel about the fragments of Judaism. What happened to “tikkun olam” (repairing the world) and kabbalist Isaac Luria’s mystical story of returning the fragmented sparks of light to the divine vessels of wholeness and unity? What does this infighting and fragmentation say to converts, the Jewish LGBT community and non-Jews of interfaith families? What kind of message do we send to the world? I converted to Judaism because I felt and wanted to be Jewish. I’m now Jewish and proud of it. An Orthodox rabbi once said, “It’s in your blood. You have a Yiddishe neshama (Jewish soul).” But becoming Jewish to that rabbi required that I adhere to a certain Judaism. If I didn’t, does that mean I still have a Yiddishe neshama? Some accepted me only after an Orthodox conversion. Reform Jewish friends judged me for converting to a restrictive and out-dated Judaism. I see this gasp of horror with Jews towards other Jews. “Look at those clothes they are wearing, aren’t they hot?” “Oy, he’s not shomer shabbos” (observes the Sabbath). In some ways, I feel the most Jewish around non-Jews because they see me as a “Jew.” Jews don’t always see me as a Jew. When I was studying for conversion, my mother gave me a silver kiddush cup that was my great-grandfather’s. I didn’t know I had Jews in the family, but he was a Latvian Jew who left Riga to avoid anti-Semitism and czarist pogroms. He came to the United States, made a name for himself in the shipping business and never spoke about being Jewish. He married a Catholic woman and renounced his Judaism to protect his family. Fragments, sparks of light. Those sparks of light were manifest in a dusty kiddush cup in a Brooklyn basement and then into questions from some members of his family. Catholic members of the family heard rumors of rabbis in the family and gasped with horror. As a person of mixed race, I have always struggled with being different, as an American, not only as a Jew. I was proud of my culture but always felt acutely aware of having a dual identity. It was hard to be both without the repercussion of exclusion. For all our freedoms in the United States, many Americans are marginalized and isolated for trying to be American. Perhaps this alienation as a child has fueled my passion to help people, specifically those who are deemed “different,” whether because of the majority society’s racism, sexism, ageism–or insistence on the right brand of Judaism. I have a 2-year-old son named Boaz Jules and we are expecting our second son in May, God willing. Boaz is named after the husband of Ruth, the first convert. Jules was the name of his great-great-grandfather. This little miracle, a person we brought into this world, is a combination of everything that came before him, Everything about parenting is amazing to witness and experience. I thought converting to Judaism was the most important and influential choice in my life. I learned that having a child is. Judaism has survived over the millennia because we turned to each other, observed and honored tradition and passed on our Jewish faith and ideals to our children. It was necessary at those times to stick together, hunker down and consolidate in order to survive. Now it is time to reach out, open our arms and expand in order to survive. From the personal exchanges on the street to the world-stage politics of the Middle East, a paradigm shift is needed where we accept ourselves in order that the world may accept us. Our children are the only investment for Jewish survival. Figuring out what “Jewish” means is our greatest challenge. Akira Ohiso is a writer and artist who recently completed his second book Surviving. He is the cofounder of Zinc Plate Press, an independent publishing company. He currently blogs at Zinc Plate Press Blog and is working on his third book, Suburb Seventies.